Have looked at the KGD sometime ago myself. QRPproject.de used to sell a version, but discontinued it for some reason. If I get the time, I might try and make one, I have found English notes somewhere, just need to find them again! Have you seen this page Julian? Thanks! The page in English is much easier to understand! Mind you if the coils get hot, it suggests the antenna isn't very efficient. And the need for a very high voltage capacitor presents a constructional difficulty. 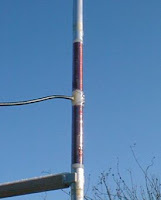 But it might still be useful as a dedicated antenna for low power WSPR use or similar. I'm currently experimenting with a derivate from the KGD-antenna. I could not find precise building figures (coil turns and capacitor value). So I went on my own and build a 40m prototype dipole made of a central coil covered by a coupling coil (no capacitor). Due to severe antenna restrictions I use this as an indoor antenna, QRP only. Of course, under those circumstances I noticed no coil warming up problems. I made some nice QRP QSO from Belgium (Moscow, Bucarest, Belgrad). 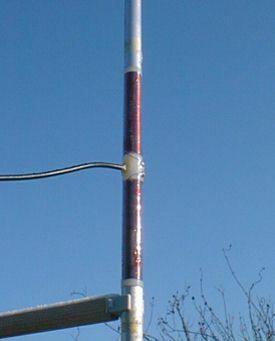 I build also a serie of MicroVert DL7PE antennas (80, 30, 20m).